Grilled Cheese Sandwiches are one of those very versatile sandwiches, pair it with a bowl of soup for a hearty lunch or add a salad for a great dinner. Raising 3 boys, I have made my share of Grilled Cheese, but I will have to admit, probably 99% of them have been the normal, everyday, Grilled Cheese Sandwich made with American cheese and white bread. 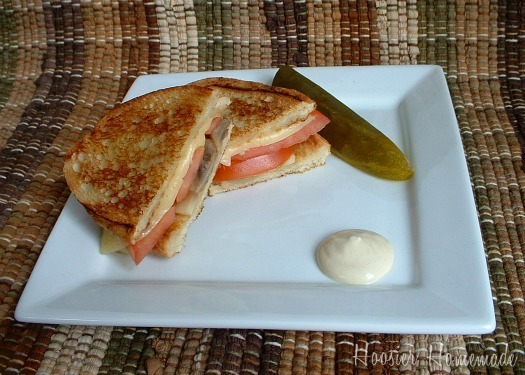 I was recently challenged by Jarlsberg Cheese and Kitchen Play to come up with an unique Grilled Cheese Sandwich. Jarlsberg Cheese is a Norwegian cheese that is reminiscent of Swiss cheese, but with a nutty, buttery flavor. My husband, Doug and I, put on our thinking caps and created this Grilled Cheese Sandwich. And let me tell you…it’s nothing short of fantastic! I had two of them and made a special trip to the store for more cheese because I was craving another one the next day. Melt butter in a small saucepan, add sliced mushrooms. Slightly saute and then add minced garlic. Cook until mushrooms are lightly brown and soft. Set aside. Slice bread on an angle and butter one side. 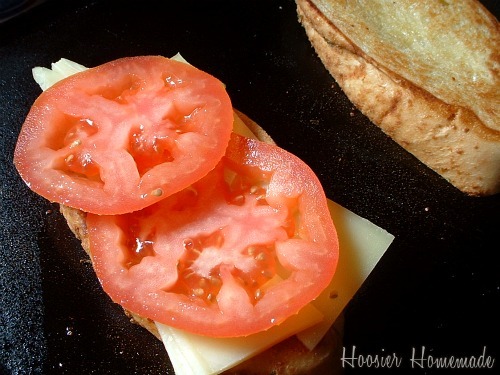 Slice cheese and tomato thinly. Heat Electric Griddle and spray with non-stick cooking spray. Add bread, buttered side down. Butter other side of bread. When the bread is toasted flip over. Add several slices of cheese. Add a couple slices of tomato. Add the top piece of bread. 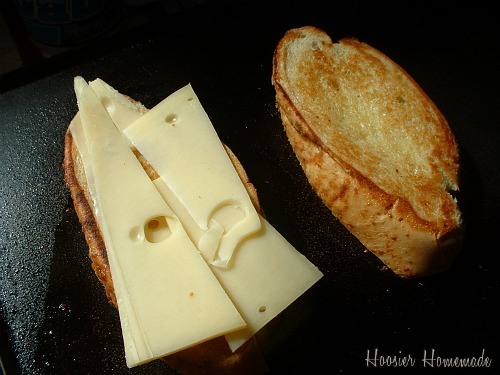 Place a heavy pan on top to press sandwich down and grill until cheese is melted and bread is browned. Serve with a mixture of mayonnaise and Dijon mustard. And a pickle spear on the side if you like. Did you know?? April is Grilled Cheese month! 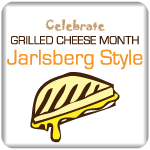 During the month of April, Jarlsberg will be giving away “Toastabags” on its website. Making a Grilled Cheese Sandwich in your toaster! How cool is that? Just submit your favorite grilled cheese sandwich recipe and receive a ToastaBag and a $1 off coupon for your next purchase of Jarlsberg Cheese. You can join them on Facebook too! What is your favorite Grilled Cheese Sandwich? Visit KitchenPlay for more great sandwich ideas! Disclosure: I was compensated for this post by Jarlsberg Cheese. All the opinions and photos are my own. Thanks for creating such a delicious grilled cheese sandwich for this event. Sounds like it’s a keeper, considering the extra grocery run for more Jarlsberg! Can’t wait to try it myself. What a great combo. Love the fresh veggies with the melty cheese. Especially on that great bread! 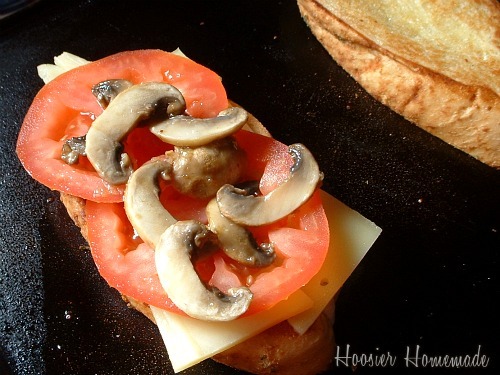 I love grilled cheese and tomato sandwiches, I never thought about adding mushrooms though. I’ll have to try this soon. 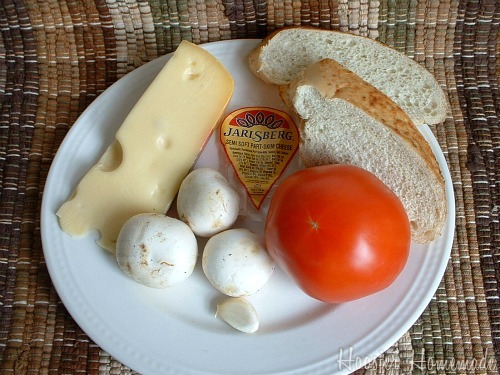 The mushrooms and tomato are a great addition to the Jarlsberg cheese. Great sandwich, Liz! YUM! Love a good pickle to go with my grilled cheese. I love mushrooms and Jarlsberg cheese together. I make a similar grilled cheese, except I use ham instead of tomato. Yum! I wrote a post and mentioned you. I hope you check it out, thanks!